Rickettsia prowazekii is a species of gram-negative, alphaproteobacteria, obligate intracellular parasitic, aerobic Bacillus bacteria that is the etiologic agent of epidemic typhus, transmitted in the feces of lice. In North America, the main reservoir for R. prowazekii is the flying squirrel. R. prowazekii is often surrounded by a protein microcapsular layer and slime layer; the natural life cycle of the bacterium generally involves a vertebrate and an invertebrate host, usually an arthropod, typically the human body louse. A form of R. prowazekii that exists in the feces of arthropods remains stably infective for months. R. prowazekii also appears to be the closest free-living relative of mitochondria, based on genome sequencing. An obligate parasite or holoparasite is a parasitic organism that cannot complete its life-cycle without exploiting a suitable host. If an obligate parasite cannot obtain a host it will fail to reproduce. This is opposed to a facultative parasite, which can act as a parasite but does not rely on its host to continue its life-cycle. Obligate parasites have evolved a variety of parasitic strategies to exploit their hosts. Holoparasites and some hemiparasites are obligate. Henrique da Rocha Lima was a Brazilian physician, pathologist and infectologist born in Rio de Janeiro. With his friend, Stanislaus von Prowazek, he described what would later be known as Rickettsia prowazekii, the pathogen of epidemic typhus. Rocha Lima named the organism after Prowazek and American bacteriologist Howard Taylor Ricketts (1871-1910). Stanislaus Josef Mathias von Prowazek, Edler von Lanow, born Stanislav Provázek, was a Czech zoologist and parasitologist, who along with pathologist Henrique da Rocha Lima (1879-1956) discovered the pathogen of epidemic typhus. The mitochondrion is a double-membrane-bound organelle found in most eukaryotic organisms. Some cells in some multicellular organisms may, however, lack them. A number of unicellular organisms, such as microsporidia, parabasalids, and diplomonads, have also reduced or transformed their mitochondria into other structures. To date, only one eukaryote, Monocercomonoides, is known to have completely lost its mitochondria. The word mitochondrion comes from the Greek μίτος, mitos, "thread", and χονδρίον, chondrion, "granule" or "grain-like". Mitochondria generate most of the cell's supply of adenosine triphosphate (ATP), used as a source of chemical energy. Vaccines against R. prowazekii were developed in the 1940s, and were highly effective in reducing typhus deaths among U.S. soldiers during World War II. Immunity following recovery from infection with, or by immunization against, R. prowazekii is lifelong in most cases. However, R. prowazekii can establish a latent infection, which can reactivate after years or decades (referred to as Brill-Zinsser disease). Treatment with tetracycline antibiotics is usually successful. Virus latency is the ability of a pathogenic virus to lie dormant (latent) within a cell, denoted as the lysogenic part of the viral life cycle. A latent viral infection is a type of persistent viral infection which is distinguished from a chronic viral infection. Latency is the phase in certain viruses' life cycles in which, after initial infection, proliferation of virus particles ceases. However, the viral genome is not fully eradicated. The result of this is that the virus can reactivate and begin producing large amounts of viral progeny without the host being infected by new outside virus, denoted as the lytic part of the viral life cycle, and stays within the host indefinitely. Epidemic typhus is a form of typhus so named because the disease often causes epidemics following wars and natural disasters. The causative organism is Rickettsia prowazekii, transmitted by the human body louse. Legionella pneumophila is a thin, aerobic, pleomorphic, flagellated, nonspore-forming, Gram-negative bacterium of the genus Legionella. 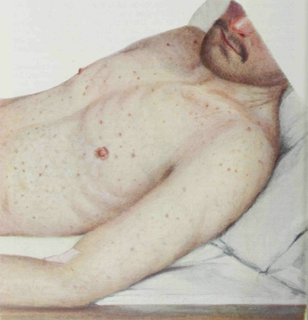 L. pneumophila is the primary human pathogenic bacterium in this group and is the causative agent of Legionnaires' disease, also known as legionellosis. Genome size is the total amount of DNA contained within one copy of a single genome. It is typically measured in terms of mass in picograms or less frequently in Daltons or as the total number of nucleotide base pairs typically in megabases. One picogram equals 978 megabases. In diploid organisms, genome size is used interchangeably with the term C-value. An organism's complexity is not directly proportional to its genome size; some single cell organisms have much more DNA than humans. Bernhard Nocht Institute for Tropical Medicine; (BNITM) is a medical institution based in Hamburg, Germany which is dedicated to research, treatment, training and therapy of tropical and infectious diseases. Sindbis virus (SINV) is a member of the Togaviridae family, in the alphavirus subfamily. The virus was first isolated in 1952 in Cairo, Egypt. The virus is transmitted by mosquitoes SINV causes sindbis fever in humans and the symptoms include arthralgia, rash and malaise. Sindbis fever is most common in South and East Africa, Egypt, Israel, Philippines and parts of Australia. Sindbis virus is an "arbovirus" (arthropod-borne) and is maintained in nature by transmission between vertebrate (bird) hosts and invertebrate (mosquito) vectors. Humans are infected with Sindbis virus when bitten by an infected mosquito. SINV has been linked to Pogosta disease in Finland, Ockelbo disease in Sweden and Karelian fever in Russia. Typhus, also known as typhus fever, is a group of infectious diseases that include epidemic typhus, scrub typhus and murine typhus. Common symptoms include fever, headache, and a rash. Typically these begin one to two weeks after exposure. ↑ Henrique da Rocha Lima at Who Named It? 1 2 Bishop-Lilly, Kimberly A.; Ge, Hong; Butani, Amy; Osborne, Brian; Verratti, Kathleen; Mokashi, Vishwesh; Nagarajan, Niranjan; Pop, Mihai; Read, Timothy D. (2013-06-27). "Genome Sequencing of Four Strains of Rickettsia prowazekii, the Causative Agent of Epidemic Typhus, Including One Flying Squirrel Isolate". Genome Announcements. 1 (3). doi:10.1128/genomeA.00399-13. PMC 3695431 . PMID 23814035. ↑ Kurland, Charles G.; Andersson, Siv G. E.; Zomorodipour, Alireza; Andersson, Jan O.; Sicheritz-Pontén, Thomas; Alsmark, U. Cecilia M.; Podowski, Raf M.; Näslund, A. Kristina; et al. (1998). "The genome sequence of Rickettsia prowazekii and the origin of mitochondria". Nature. 396 (6707): 133–40. Bibcode:1998Natur.396..133A. doi:10.1038/24094. PMID 9823893. "Rickettsia prowazekii::Taxon Overview". PATRIC. Virginia Bioinformatics Institute. NIAID Biodefense Research Agenda for Category B and C Priority Pathogens (PDF). 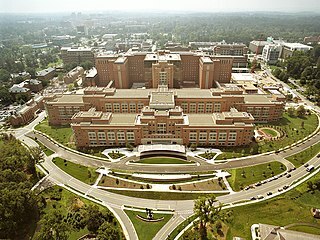 National Institutes of Health, National Institute of Allergy and Infectious Diseases. January 2003. The National Institutes of Health (NIH) is the primary agency of the United States government responsible for biomedical and public health research. It was founded in the late 1870s and is now part of the United States Department of Health and Human Services. The majority of NIH facilities are located in Bethesda, Maryland. The NIH conducts its own scientific research through its Intramural Research Program (IRP) and provides major biomedical research funding to non-NIH research facilities through its Extramural Research Program. The National Institute of Allergy and Infectious Diseases (NIAID) is one of the 27 institutes and centers that make up the National Institutes of Health (NIH), an agency of the United States Department of Health and Human Services (HHS). NIAID's mission is to conduct basic and applied research to better understand, treat, and prevent infectious, immunologic, and allergic diseases.